English style bellringing is a fascinating activity that requires physical co-ordination, a sense of rhythm and good listening skills. It provides mental and physical stimulation, along with the social aspect of working with other ringers. Looking back at things I have done shows the breadth and richness that ringing has to offer. Follow the links to find out about many different aspects of the ringing world. I learnt to ring in 1959 at St Wilfrid's, Kirkby in Ashfield, Nottinghamshire (see pictures). I rang with the Southwell Diocesan Guild and the East Derbyshire and West Notts Association . When Kirkby was augmented to eight bells in 2001, I was in the band that rang the first peal on the eight. I am a member of the Cambridge University Guild of Change Ringers. I rang at Guildford Cathedral before I married. I have rung at All Saints Wokingham since the late 1970s. A lot of my time is involved with training. I am chairman of the Oxford Diocesan Guild Education Committee and of the Sonning Deanery Branch. 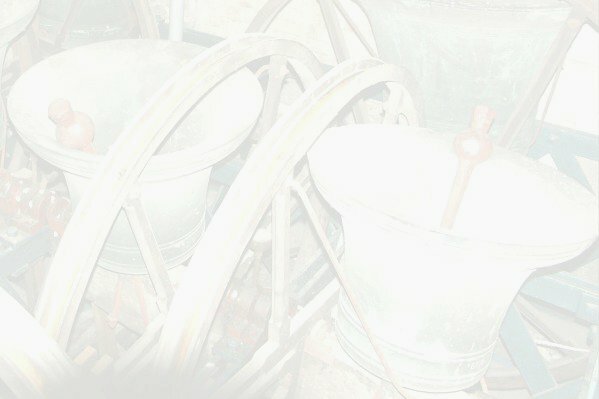 I am a member of the Central Council of Church Bellringers. I chaired the Education Committee for 8 years and led the working group that set up the Ringing Foundation. I am chairman of the Biographies Committee. and former chairman of the Public Relations Committee . I have run courses in many parts of the country, including over 30 listening courses . 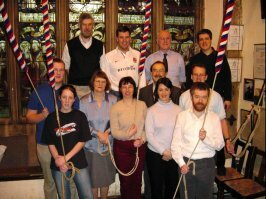 My most unusual training assignment was to teach the actors who played bellringers in the Midsomer Murders episode ' Ring Out Your Dead'. See the article about making the programme. I wrote a series of articles about music in ringing after being invited to give a talk to a group of musicians. My book 'Living Heritage ', a social history of bellringing in Wokingham over the last 300 years, is written mainly for non-ringers. My book 'Bells & Bellringing ' was published by Shire Books. I use modern teaching aids including simulators. I have produced training aids, including CDs and !Strike . I made a counter-rotating dumbbell (which works with a simulator). I didn't realise it at the time, but it is based on a similar principle to that used by my namesake, the 18th century John Harrison in his early clocks. All material Copyright © 1964 - 2013 John Harrison.